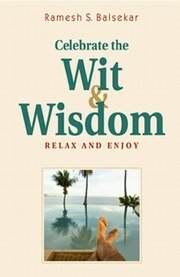 Celebrate The Wit & Wisdom Understanding comes to different people through different routes. With some it scores a direct hit with wisdom; with others it seeps in almost innocuously through the subtle layers of wit, anecdotes and teaching stories. No one knows just when it will strike and how. Take quintessential wisdom for example. Ramana Maharshi says, “All that needs to be said ha been said in Verse 170 of Acharya Shankaracharya’s Vivekachudamani: In the dream state, even though there is no contact with the outside world, the mind alone projects the entire dream-universe of enjoyer etc. Similarly, the waking state is no different. All this [world of pluralistic phenomena] is but a projection of the mind. And then there is the story about Responsibility. The child kept sneezing, one sneeze after another. The mother got annoyed and shouted, “John, stop sneezing!” The boy answered: “Mum, I am not sneezing. It is sneezing me. Don’t you see that? !” Come, celebrate the wit and wisdom brought to you by one of the finest teachers of Advaita.